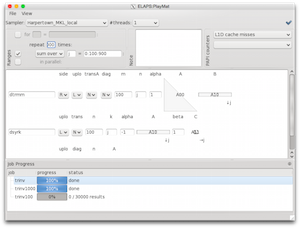 ELAPS is a multi-platform open-source environment for fast yet powerful experimentation with dense linear algebra kernels, algorithms, and libraries. It allows to construct experiments to investigate how performance and efficiency vary depending on factors such as caching, algorithmic parameters, problem size, and parallelism. Experiments are designed either through Python scripts or a specialized GUI, and run on the whole spectrum of architectures, ranging from laptops to clusters, accelerators, and supercomputers. The resulting experiment reports provide various metrics and statistics that can be analyzed both numerically and visually. International Journal of High Performance Computing, pp. 1-13, March 2018. In scientific computing, optimal use of computing resources comes at the cost of extensive coding, tuning and benchmarking. While the classic approach of “features first, performance later” is supported by a variety of tools such as Tau, Vampir, and Scalasca, the emerging performance-centric approach, in which both features and performance are primary objectives, is still lacking suitable development tools. 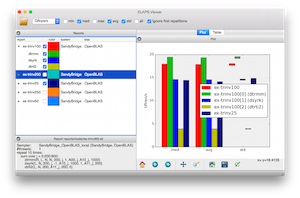 For dense linear algebra applications, we fill this gap with the Experimental Linear Algebra Performance Studies framework (ELAPS), a multi-platform open-source environment for easy and fast, yet powerful performance experimentation and prototyping. In contrast to many existing tools, ELAPS targets the beginning of the development process, assisting application developers in both algorithmic and optimization decisions. With ELAPS, users construct experiments to investigate how performance and efficiency depend on factors such as caching, algorithmic parameters, problem size, and parallelism. Experiments are designed either through Python scripts or a specialized GUI, and run on a spectrum of architectures, ranging from laptops to accelerators and clusters. The resulting reports provide various metrics and statistics that can be analyzed both numerically and visually. In this paper, we introduce ELAPS and illustrate its practical value in guiding critical performance decisions already in early development stages.